FDIC clearly shows that when it comes to bank financial performance, size matters, and it matters a lot. For twelve of the last fifteen years, big banks have outperformed little banks, and since 2010, the earnings rates of big banks have pulled away from smaller competitors. While regulators worry about regulating “too big to fail institutions”, thousands of banks that are too small to succeed and too poor to survive are in danger of extinction. Unless small banks raise their game and begin to earn adequate returns, the United States will lose its community-based banking industry. Data on the blight of the community and small banks is published by the FDIC in its Quarterly Banking Profile which contains key industry performance data and analysis. One of the tables buried deep in the Quarterly Banking Profile segments industry performance data by the asset size of the reporting institutions. Below is selected data from the FDIC report. In Q1 2013, the most reliable predictor of bank equity returns was size; the bigger the bank, the bigger the rate of return on equity. The first quarter of 2013 was not good for small banks. Not only did they earn less than their larger competitors, but the average return on equity earned by banks under $1 billion in size was inadequate to remain competitive as a viable investment alternative for shareholders. Instead of enjoying a strong return to profitability from economic expansion and a reduction of problem loans, the below chart suggests that on average, only the largest depository institutions are earning an adequate return on equity for shareholders. Essentially, size was a strong predictive factor determining return on equity. Almost every year since 1997, small banks have underperformed large banks. 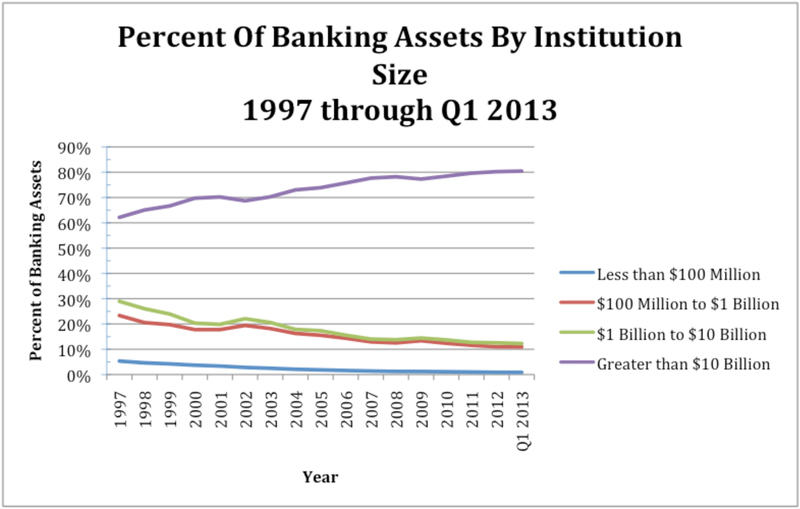 And, since the financial crisis, mid-sized banks have fallen behind large banks. As illustrated below, except during the peak of last decade’s banking crisis, the smallest banks have dramatically underperformed the largest banks. As an example, in the first quarter of 2013, banks with less than $100 million in assets had an average return on equity that was 4.22% lower than the average return on equity for banks with more than $10 billion in assets. Mid-sized community banks on average performed only marginally better than the smallest banks, and they underperformed relative to big banks. And while from 1997 until 2002, regional banks outperformed large banks, since 2002, regional bank returns have almost always been inferior to large bank returns. In short, regional banks have lost ground to large banks over the last 15 years. Banking consolidation continues as large banks gain market share at the expense of their smaller and underperforming competitors. Since 1997, big banks have accumulated market share at the expense of their smaller competitors. The concentration of assets in the highest return industry players shouldn’t be a big surprise to anyone. After all, in a free market, capital and customers flow to the highest performing competitors and to the competitors with the highest returns within any industry. “Too small to succeed” is the new normal for thousands of small banks. Industry consolidation will continue. As a practical matter, community-based banking in the United States is dying. In 1997, there were a total of 8,776 banks with less than $1 billion in assets. As of March 31, 2013, there were 28% fewer banks under $1 billion. And, since 2009, the FDIC and other banking regulators haven’t granted new banking licenses, which is why there are no new banks being formed to replace community banks that have been acquired by larger competitors or failed. A 28% industry mortality rate doesn’t bode well for the future. As of March 31, 2013, there were 7,019 banks in the United States, and only 109 of the banks, or 1.55%, were larger than $10 billion in size. Unfortunately, the other 98.45% of banks are at risk. As bank regulators concentrate on policies to rein in the ‘too big to fail’ banks, their efforts are being undermined by the failure of community and small regional institutions to survive and the resulting increase in market share by the biggest banks. If small and mid-size bank performance doesn’t improve, industry consolidation will continue. There will be dramatic economic, social and public policy implications for the United States if community-based banking institutions continue to die. Economic power and decision making will become more and more concentrated, and consumers and businesses will be denied the option to choose whom they bank with. While the handwriting is on the wall for community-based banks, it can still be erased and rewritten. There is still time to save the community-based banking system. In future articles, I will explore the details of why bank size matters and what regulators and policy makers can do to help small banks successfully compete without compromising their regulatory principals. Author: Mark Sunshine is the Chairman and CEO of Veritas Financial Partners, a leading financial services firm providing senior secured loans to middle market businesses and comprehensive credit management services to banks and other financial institutions. Prior to founding Veritas, Mr. Sunshine was the President of First Capital and the President and CEO of Siemens First Capital. Both companies were global commercial lenders. Previous Jennie Kim of Great American Group discusses how being a woman makes a difference when building relationships within the financial services industry.